On September 15, events company Moonfire Inc., will host the “The Young and Reckless” at B-Side, The Collective in Makati City, showcasing the latest talents in independent music and entrepreneurship. Along with up and coming Filipino entrepreneurs, the event will have bands and DJs performing at the venue. One of the brands featured at the event is footwear label, Soule. The eco-friendly brand sells footwear made of recycled materials: the upper portion of the shoe is made from used clothing and excess fabric while the sole is made from recycled airplane tires. Moreover, Soule packaging is socially conscious. It is made from recycled flour bags handmade by indigent people in Laoang, Samar. Another brand to look forward to is Nick Automatic, the brandchild of Nicolo Nimor, the clothing line known for its colorful retro designs on t-shirts and hoodies. Part of the event\\\'s proceeds will be donated to Childsville Philippines, a child caring institution to educate and house orphaned and abused children. The event begins at 8 p.m onwards at The Collective located at 7274 Malugay St. San Antonio, Makati City. 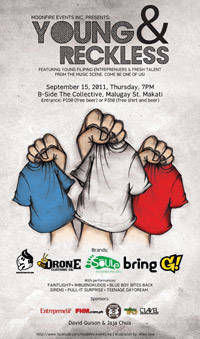 Entrance fee is P150 (includes beer) and P350 (includes shirt and beer). The Collective is an alternative creative space meant to nurture unique retail concepts from restaurants to organic goods to one-of-a-kind clothing. For a map to the area, click here. Check out the event\\\'s video here. "Bring" by Bin Ubaldo was founded last August 24 2010. After graduating from University of Asia & the Pacific, she decided to put up her own online store driven by her passion for rings. "Bring" offers you a wide variety of fashion rings suitable for both male and female. "Bring" rings are made out of zinc alloy, with assortments from single finger to four finger connector rings. Aside from being affordable, "Bring" rings are not just trendy but it also adds flair to your fashion wardrobe, where no one can ever go wrong! <>Bring offers you a wide variety of rings from one to four finger rings. Some rings came from Thailand, others from China. Also, expect more upcoming rings which are designed by yours truly, Bin Ubaldo.